Many of my early preconceptions about the pilots of the Second World War came from a childhood of reading ‘Commando’ comics and watching films such as ‘The Dam Busters’ and ‘Battle of Britain’. To my young mind the pilots and crew of the RAF were gallant and fearless, taking the fight to the Boche before heading home to the mess to raise a glass to comrades who did not make it back. ‘And Some Fell on Stony Ground’ is a reality check to this rose-tinted view. The book covers a few brief hours in the life of a bomber pilot. Whilst it is a fictional account its author, Leslie Mann, did serve in the RAF during the war as a tail gunner. For whatever reason he chose to write a novel rather than a memoir based on his experiences, yet I do not doubt that those experiences are reflected in his writing. Mann’s pilot character, the war-weary Mason, is rather the antithesis of the RAF officer of my young imagination. Brave undoubtedly, but scared. Scared of not making it through his next op, scared of admitting this to anyone, and scared to acknowledge that there might be life once the war was over, as if doing so tempted fate in itself. His fear is palpable, with an underlying feeling that each successful mission increases the inevitability that the next one will be his last. Mason’s relationships with his fellow crew feature heavily. With many of his original friendships ended due to death or injury he is reluctant to forge new ones and spends much of his time trying to avoid others. Guarded and introvert, he finds it difficult to bond even with his immediate crew. Much of the book is a preamble to the night op that is its culmination. Mason dreads the coming mission but passes the time dwelling on the missions he has already completed. Feelings of resentment and bitterness cloud his thinking, but above all his sense of weariness prevails. A fine foreword by Richard Overy sets the book in context and gives some details about Mann’s wartime career and the British bombing campaign. 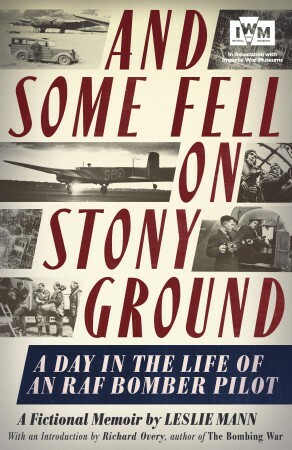 ‘And Some Fell on Stony Ground’ dispels the notion that life in the RAF was heroic and glamorous. Mann’s anti-hero is a reluctant participant, struggling to deal with the dichotomy between the pressure of the missions and the quasi-civilian life that the crew members lived whilst not on duty. It is a struggle that Mann captures with candour and depth.